Big Rock Creek begins at an elevation of 6565' on the northern side of the saddle at Vincent Gap. 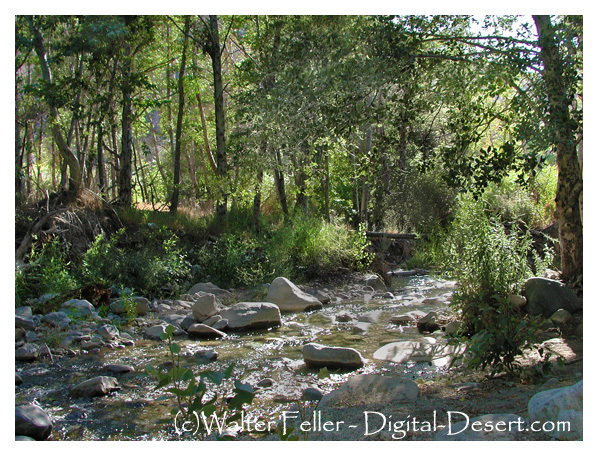 The creek descends the canyon and is fed by several small tributaries before percolating into the aquifer and disappearing into the desert. aerial photos along the pearblossom highway - Devil's punchbowl, little rock, palmdale, oak hills, phelan, ... Looking southwest up Big Rock Creek canyon. ... between two mountains on a north-trending ridge, and hence the drainage on all sides of the saddle goes to Big Rock Creek, thence to the Mojave Desert. Men hacked at the solid rock throughout the day. ... lower Swarthout Valley, near the Cajon Pass, to the Big Rock Creek area in what is called today Valyermo.